Over the years, there have been countless brands of American guitars built in small numbers - with many of them being high quality instruments that simply did not have the marketing or broad distribution to become long lasting enterprises. The subject of this post is an Oasis electric guitar that belongs to my friend and former bandmate Eric Tucker, who is also the chef at Millennium Restaurant in San Francisco. I've had the pleasure of playing and even recording with this fine instrument, many years ago. 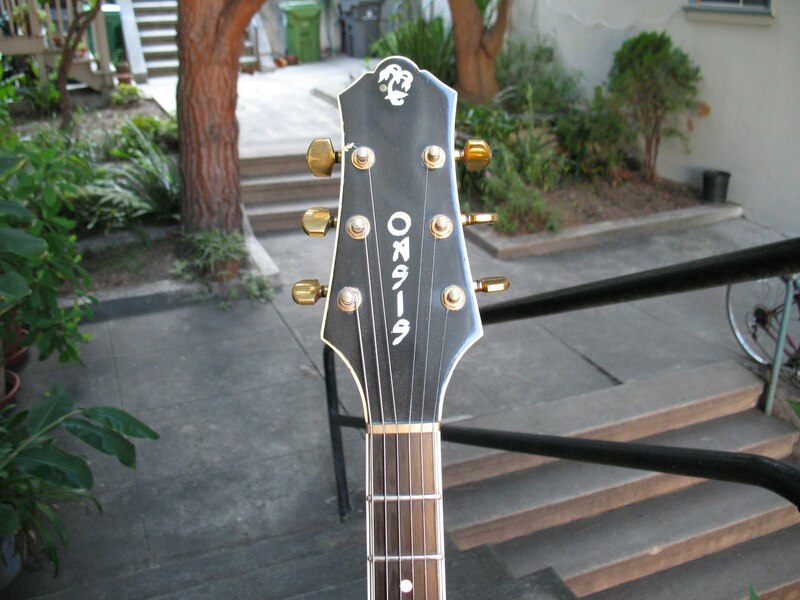 The Oasis brand existed from around the mid-70s until the early or mid-80s and the company was headed by luthier Gary Cooper, who worked in the San Francisco Bay Area. I haven't confirmed it, but I believe Cooper may have been an alum of Alembic or had some association with that Bay area firm. I have no idea how big the Oasis operation was - given the rarity of the instruments it may well have been a one-man operation. This particular Oasis is built from what I believe is korina - a blonde mahogany - made famous for its use in the original 1950s Gibson Flying V and Explorer. Eric's recollection is that he got the guitar in 1982 at either 48th Street Music or Stuyvesant Music in exchange for a Guild and a Yamaha acoustic. 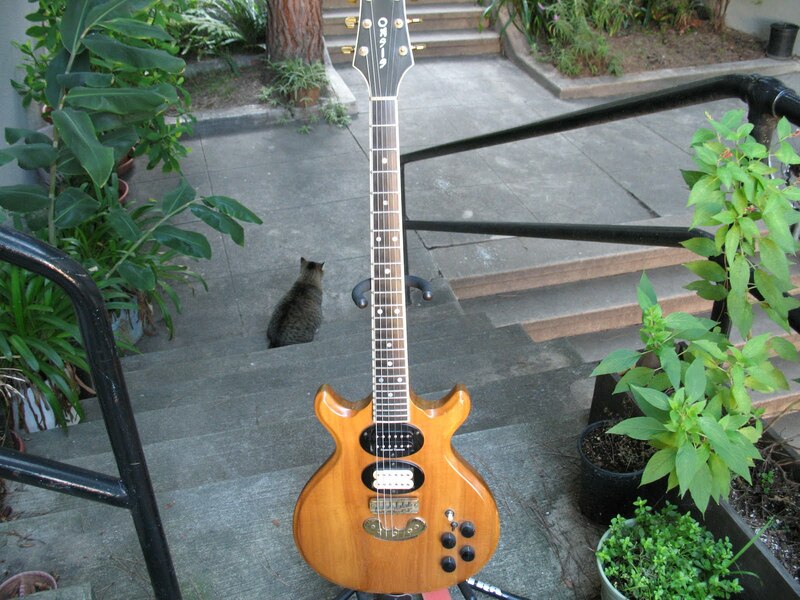 The guitar is probably from the late 70s or 1980, judging from some other posts I've seen around the internet. The guitar was originally equipped with two humbuckers with solid black covers, which may have been Bartolinis - and were according to Eric, low-impedance and fairly low output units. Currently, Eric's guitar has a 1983 Dimarzio Super Distortion in the bridge position and a 90s Seymour Duncan Jazz pickup in the neck. The guitar is very well built - and I remember it having nice even action - I used this guitar to record almost all of my guitar tracks on the one Crucial Youth album - playing through an early 70s Marshall stack that belonged to producer Nikki Garratt (UK Subs). The information available on Oasis and Gary Cooper is sparse at best, but Eric did send me a link to a cool Youtube video that edits together parts of two interviews that Cooper did for cable TV. During the first part of the interview, which I believe was done around 1980, Cooper is holding a guitar that appears identical to the Oasis in this post. During the second part, Cooper is showing off some more mid-80s looking designs, complete with locking tremelos and "droopy" headstocks. 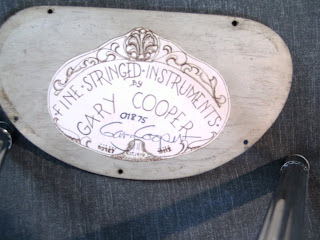 Sadly, Gary Cooper was killed in a car crash around 10 years ago - if anyone has an exact year, please let me know! Also, if you have an Oasis guitar or other pictures and information - please let me know and I'll add to the post. Jerry was kind enough to share a picture of his Oasis guitar, which is a prototype for Oasis guitars, and dates to 1975/1976. 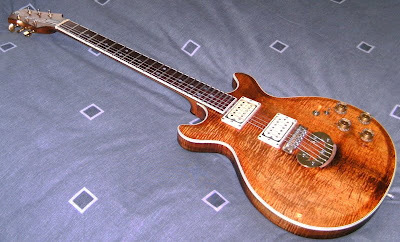 This guitar differs from Eric's in having what appears to be an arched and bound flamed koa body, a different tailpiece and off-the-shelf pickup surrounds (see below - these are not original). The overall body and neck profile appear to be the same as Eric's korina wood example. "This guitar was developed for me in mid 1975. Gary let me choose the woods for it and let me help design it. Serial #018, it is the prototype guitar for his Oasis line. 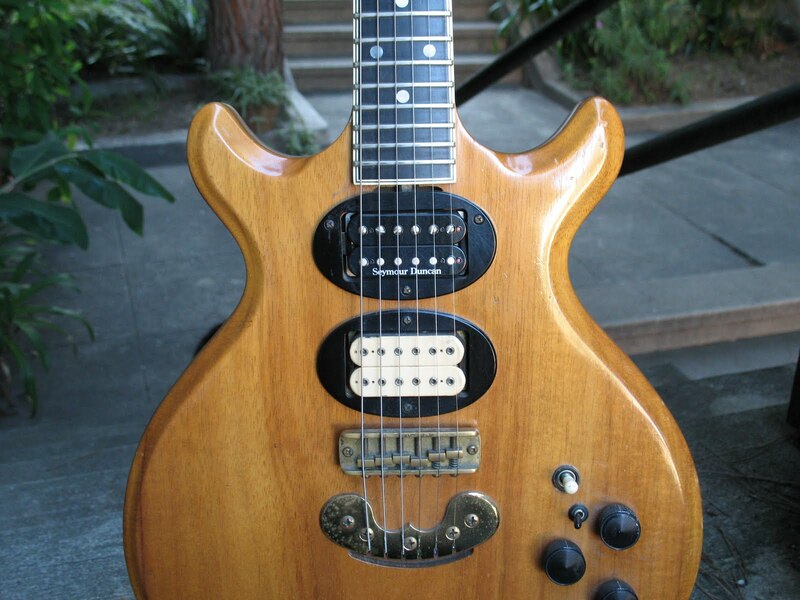 After the NAMM Show in 1976(winter show), Gary built a matched set (electric guitar and mandolin) for Seals and Crofts based on this guitar. I have recently been in contact with his original building partner, Louis Armstronger(no kidding)." "The body is solid bookend matched flame koa. 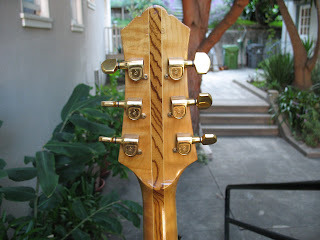 The neck consists of two pieces of maple,two strips of rosewood, two strips of alder, and vermillion down the center. The fingerboard is vermillion. The headstock has a veneer of flame koa. Neck and body are bound with white-black white binding. 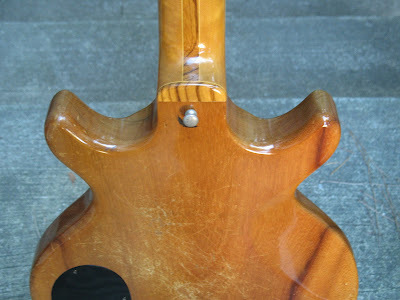 The control cavity on the back of the guitar is matched flame koa. Tuners are Schaller. This guitar originally came with Bartollini Hi-A Beast pickups. It now sports a Seymour Duncan JB at the bridge, and an original D'Marzio PAF at the neck. 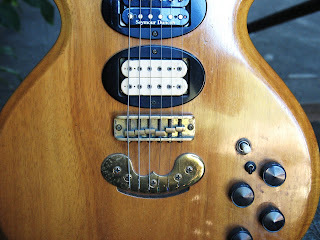 The Les Paul pickup switch is from Owsley Stanley III's '53 Les Paul.....a little San Francisco Ju-Ju." Watch for some additional photos of this beautiful instrument in the near future. Wow, it's been a long time since I've seen a cooper-built axe. I used to work with him at Skips Music in Sacramento. It's a shame he is no longer with us. Congrats on the rare find! The guitar actually belongs to my old friend Eric Tucker, chef at Millennium in SF. But I've long admired this guitar ! Saw your post on your site about Oasis Guitars. I'm so glad there is still an interest in these instruments. I own the original prototype double cut Oasis. Hand built by Gary Cooper and his partner in crime, Louis Armstrong. My Oasis was in the winter NAMM in Los Angeles 1976. The serial #018. I got to hand pick the woods used and helped develope the body style. I still have this guitar. Are you interested in seeing pics? What about the Xmas album? it was at least longer than a 7" single. The "Crucial Yule" EP was recorded using my modified Squier Bullet guitar with a Dimarzio Super Distortion pickup, plugged into Eric Tucker's Laney AOR combo amp I believe. I was playing at a party last nite and after it quieted down I went into the host's house. He said, "Well, since the neighbors are already up..." and he rolled out a peavey halfstack and pulled out one of these Oasis guitars. The thing played great. The neck was a little more thick than most electrics. He said he hadn't really found out much about it, he thought the band "Oasis" in the 70's had them custom built. Back in 1976 I moved from NH via Salt Lake City to Sacramento where I was hired in March by Gary Cooper as an apprentice guitar tech, where he was doing repair and building Oasis in the basement of Lew's Music on the K Street Mall. I brought several years of cabinet-wood working skills as well as being a fanatical player. While I had some electrical, welding and woodworking skills from my high school years and employment at Paitsch Cabinet in SLC, and I tinkered at guitar repair on my own for my personal gear and friends rigs, it was Gary who taught me serious repair and manufacturing skills he aquired from his years at Alembic and his own research. Also working in the basement shop were two great guys, Louis Armstrong and Art Gomez. Art was our Polane (the few guitars made with a hard gloss epoxy coating) finish guy, the rest that came from K Street, and Juliesse Ave location, we sat in the sun and hand oiled and rubbed for hours. In less than a year on K Street, the owner, Lew Aytes decided to close the business, and Oasis moved to the Juilesse Ave location of Marconi and Interstate 80 of N Sacramento. 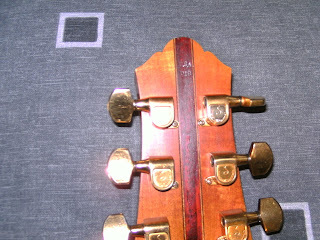 Guitars were, at that time, all oil finish. At that location we built a bass for the Hall and Oats band with a birds eye body and orange vermillion fingerboard seen on the back of the live album photo. All the instruments were equipped with Bourns pots, Bartolini pickups and Belden wire. The brass bridges and tailpieces were all cut, milled and assembled from raw brass stock right there in house. Schaller keys were the choice Gary preferred. All of us were dismissed, Gary folded and reopened a repair bench at Skips Music where he continued to build a few of his magnificent guitars, I went back to college to study music at the local City College, and Berklee in Boston, and I lost track of Lew and Art. I saw him from time to time as we shared repair questions and parts over the years, and then he stopped by to see me just after I opened my own shop in 1996, and we discussed working together again. Shortly after that I heard about him losing his life in a tragic auto accident. Gary was a brilliant, kind, and phenomenally gifted man, and was my mentor. I use all the skill he taught me today and miss his spirit immensely. Thank you all for sharing these posts and keeping the Oasis flame alive. Dave Lynch, former Oasis guitar tech. Dave - thank you so much for all your info - really great to hear it from somebody who was "there". As I said above, I always liked that guitar without knowing a whole hell about it - and never seeing another despite stopping in every guitar store in the area when I traveled throughout the 90s and early 2000's.